Business planning help in the United Kingdom. Based Near Milton keynes. Would you like to see an example of what you will be shown to set up for your business? Simply register your details and we will send you a sample copy. 4. After the training day, you will go about implementing your quarterly business plan. You will receive weekly support emails with links to videos to help you stay focused on implementing your quarterly, monthly, weekly and daily plans in your Small Business. 5. At the end of your first 90-day (quarterly) plan, you will attend the next 90-day (quarterly) planning day. Here you review your last quarter, update your business goals, assess and adjust your business financial results and plan for the next quarter. 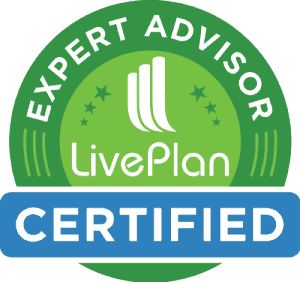 We are a ‘Certified Expert Advisor with LivePlan’ this empowers us to use this brilliant business planning and forecasting tool to make valid decisions and plans using real-time data extracted from your Xero or QuickBooks online accounting software. We all know that every business SHOULD have a business plan, however there are many types of business planning. Five-year business plans, strategic business planning and many more. Most of these aren’t suitable for Small Businesses, however, ‘LivePlan’ is “Perfect” as it integrates with your Xero or QuickBooks accounting software to empower you to plan and manage your actual financial numbers. Having coached over 300 small and medium-sized businesses, the reality is very few businesses actually see the practicality nor work to any sort of an operational business plan as somehow there never is the time to create or update your plan. Only 3% of the businesses have written business plans – and yet that 3% have phenomenally higher success rates in businesses than those businesses that don’t have nor work to a business plan! Our 90-day Business Planning Days are your chance to step out of the business, give yourself some ‘thinking time’, meet other like-minded business people, do a bit of networking and get focused. Our business coaches work with you to map out a winning game plan for the next 90 days. Plus with proven strategies and expert training, your LibAbun Business Coach will work with you and your team so you can get back to your business planning with clear direction and new tools to achieve your goals faster. We all know creating and implementing Business Planning is ‘common sense’, but ‘common sense’ rarely is ‘common practise’ in business! During the Small Business Planning Induction day you will be set up on Liveplan and connect it with your online Accounting software. We will then run you through several different modules to set up and develop your business plan foundations, stage by stage. This is a full-day training event. Once you have set up your business plan, we will then show you how to use it to correctly manage and lead your business and when you need to make adjustments and updates. Our business plans forecast out normally for three years to help you create a vision, yet we are operationally only focused on your business plan, for this year and in particular the next quarter (90 days). That is why we conduct ‘Quarterly Business Planning Training Days, to update your plan every quarter to keep you and your team focused and organised. Once you have completed your Small Business Planning Induction Course and developed your overall 3-year plan. You will need to update your plan at minimum every quarter. So we run training days specifically for this purpose. During these ‘Quarterly Business Planning days’, we have all our business coaching clients for whom it is compulsory to attend the ’90-Day Business Planning Days’ and anyone else wanting to develop a business plan in a training room for the day, so this is also a great networking event. During this training day you will update your LivePlan business plan, forecasting and budgeting in accordance with your current and future business goals and objectives. Learn the proven strategies business owners have used in the last 90 days to increase profits, increase growth, build winning teams and work fewer hours. Listen hard. Take notes. Then adapt & adopt to get them working for you. • Energy, vision and focus for the next 90 days in your business and beyond. • Take home strategies to implement and build your profits right away. • A ready-to-implement 90-day plan that you can share with your team and use to check your progress with the plan. • Powerful confidence, leadership and decision making skills to take you and your business even further. In turn it will help you and your team feel in control of your business and feel great about your business future. All Business Coaching Customers Have ‘LivePlan’ Subscription Included As Part Of Their Program. Note: The Business Planning Induction Training Day is a ‘pre-requisite’ to attend these days. Update your Small Business Plan, forecast and budget for the next quarter. Get the insights you need to make the right decisions with your Business Planning. For your business planning to succeed, you need to know your goals, which financial numbers are important to measure toward achieving your goals, and to be able to see your progress in real-time. At LibAbun we use ‘LivePlan’ to advise you on how to do all these important business management tasks and more. We are ‘LivePlan Certified Strategic Advisers’ and we use this fantastic tool to give you multiple benefits as a business planning and automation tool. The LivePlan business dashboard gives us both, the insights we need and in a format that’s simple to understand. 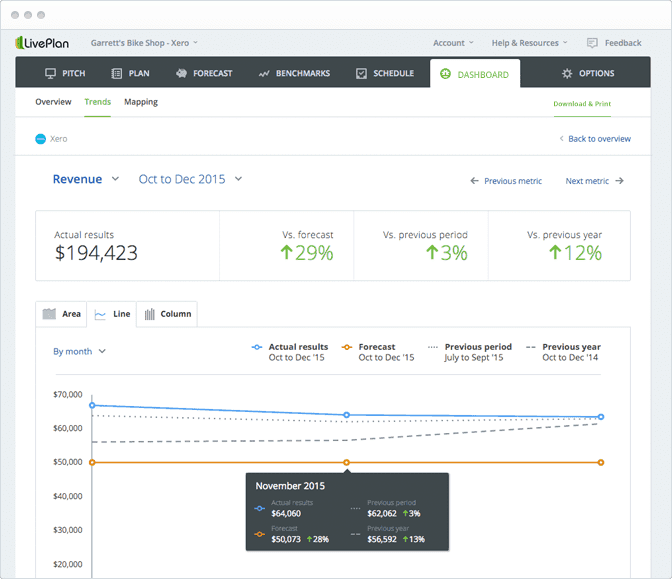 We connect our ‘LivePlan software to your accounting software, like QuickBooks or Xero, and you’ll get instant insights into your business. We will teach you how to read and correctly interpret the dashboards presented to you and work with you to advise you on the best strategies to help you achieve your business goals. This takes away all the ‘guessing work’ and puts you back in control of your business. Online Accounting software, such as Xero, is very easy to use; extremely cost-effective (approx £25/month); and it is a great tool to help you, any advisers you have, such as a Bookkeeper, your Business Coach, and your Accountant, ‘stay on top’ of your business financial accounts. The LivePlan tool integrates with both Xero and Quickbooks to present to you your business financials in graphs and formats that are much easier for you to learn and understand. All our LibAbun Business Coaching and Training customers are taught how to use an online Accounting software and the LivePlan tool as part of their Business Planning, to take back control of their business and manage it correctly. We know you’d rather be working to hit your goals than setting up your dashboards. 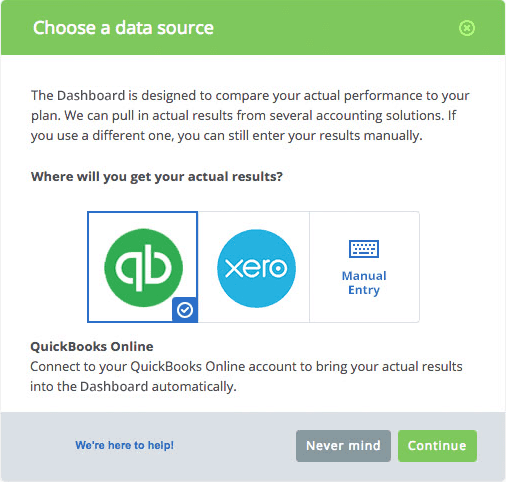 We’ll ensure your LivePlan Dashboard connects directly with your accounting software (QuickBooks and Xero) and sets up your business dashboard automatically – no customization or coding required. Make Sense Of The Numbers Without Using Spreadsheets & You Don’t Need To Be An Accountant! Using spreadsheets to analyse your financials is painful—it often requires building complex pivot tables or toggling between multiple documents. 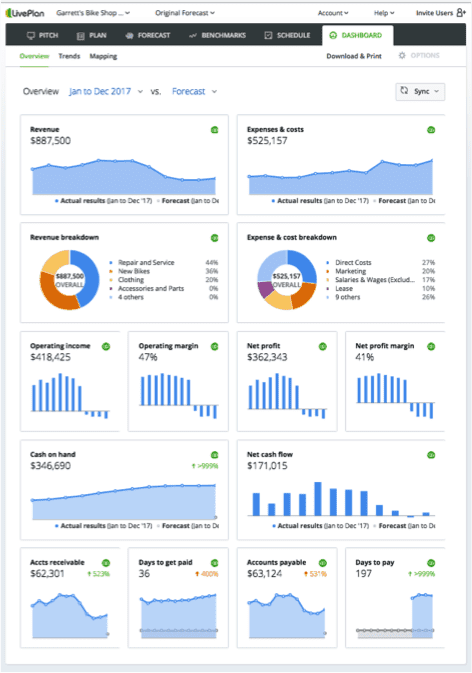 Using the LivePlan Dashboard all that hassle goes away and we can show you how to quickly build visual reports and summaries that show what your financial data really means. All that, without the need of spreadsheets and you won’t need to be an Accountant to understand it – ‘Brilliant’! Our LivePlan tool takes the hassle and pain out of your business planning, budgeting and forecasting processes. If you’re already using accounting software, we’ll just have to ‘sync’ your accounting data with the click of a couple of buttons, and then apply some growth rates or tweak a few numbers manually. You’ll then have a complete forecast and budget in no time. If you not using any online Accounting software, “No Problem” we can help you get on that too. We all should be on an online Accounting software and most Governments are requiring businesses to have their accounts online within the next few years, so you may as well get ahead of the game now. ‘That’s is correct!’ The UK Government (HMRC) are requiring all VAT registered businesses to be on an online Accounting software, such as Xero, by March 2019. We are expecting that to also be the case, for all other Small Businesses not VAT registered, sometime soon after March 2019. Using online Accounting software such as Xero, is actually good for you as a Small Business Owner. It will save you time, increase your productivity, help you make better management decisions and actually help you track all sales, payments and profits too. So the sooner you start using an online Accounting software the better off you and your business will be.